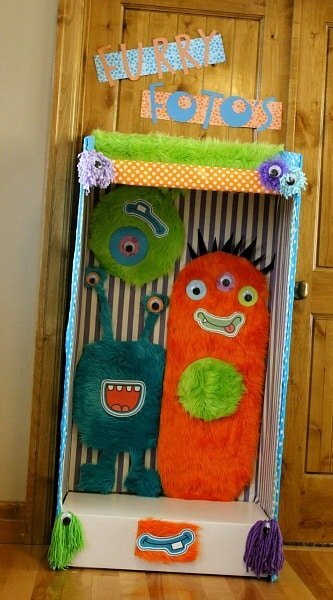 The Monster Birthday Party I posted a couple of weeks ago is already receiving a lot of attention on Pinterest. ROAR! That’s monster talk for THANKS! I didn’t know that so many of you love monsters! 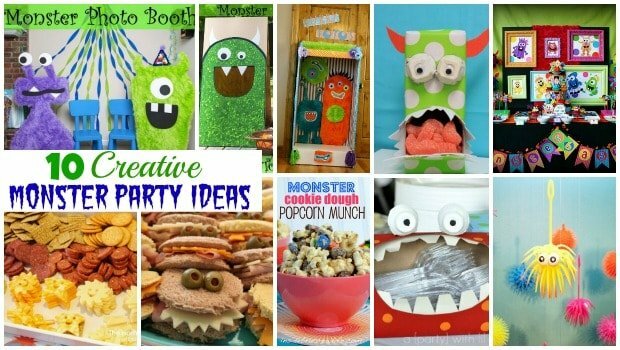 There are so many great ideas to share from other bloggers and party designers that I’ve put a list together of my favorite 10 Creative Monster Party Ideas that I’ve stumbled across. There are a lot of adorable DIY party ideas that I know you’re going to want to try! A party just isn’t a party until you have some fun games and activities! 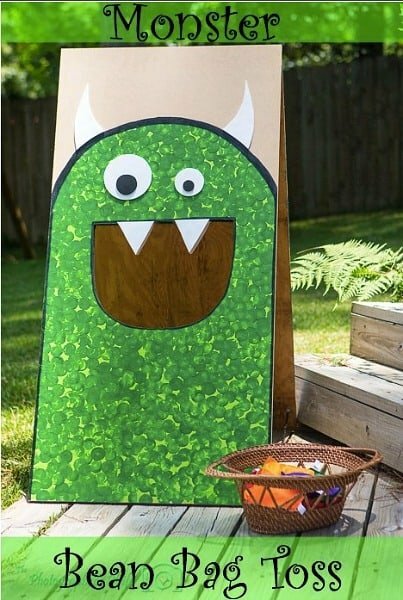 The Photographer’s Wife made this fun Monster Bean Bag Toss for her little guy’s party. The post includes detailed instructions so you can make your own at home. For my son’s first birthday party (an under the sea theme) we had a cardboard shark cutout that we used for a game and for pictures. It was a lot of fun! The Photographer’s Wife is full of one ROARsome idea after another! This second idea is so stinkin’ cute – a Furry Monster Photo Booth. Her post includes instructions on how you can make your own furry friends for the party. I absolutely love photo booths at parties and I think it’s such a fun token of appreciation to go along with your thank you cards after the party. Speaking of photo booths, check out this creative idea from Bridgey Widgey – a Furry Photo Booth! The kids will love standing in there for pictures! Sometimes one of the hardest parts of planning a party is finding food that goes along with your theme. 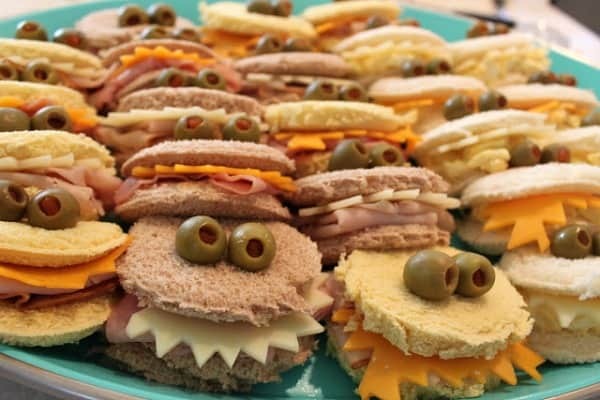 Eat Sleep Make has an adorable & easy idea for a monster party – Monster Sandwiches! What guest could turn down sandwiches as fun as these?! 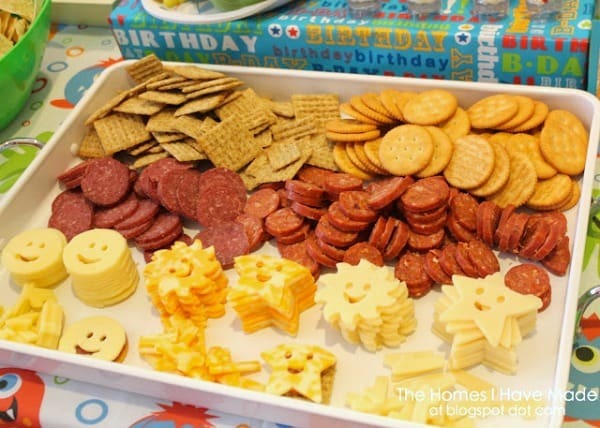 Mini buffets at parties are always a hit with little fingers. Check out this cute idea from The Homes I Have Made for a Make-A-Monster Cracker Sandwich Bar. I love those cute cheese slices! I absolutely love crafts but my ideas usually don’t turn out how I thought they would. 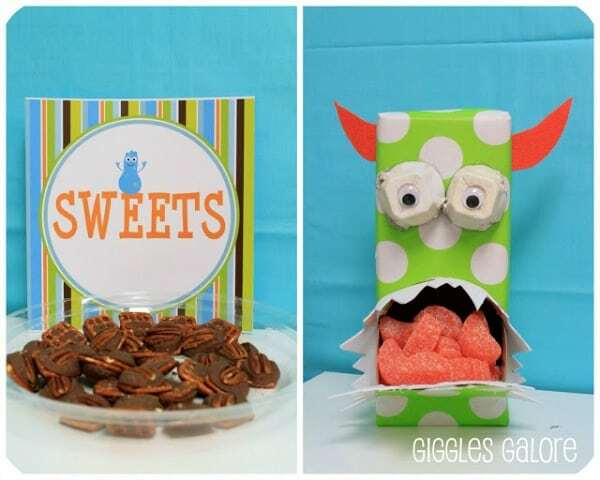 I’m always on the search for adorable DIY party decorations and I love this Monster Candy Box by Giggles Galore. You know what? I think I could actually tackle this craft plus I already have all of the supplies I need at home! I love this colorful Monster Bash party by And Everything Sweet. 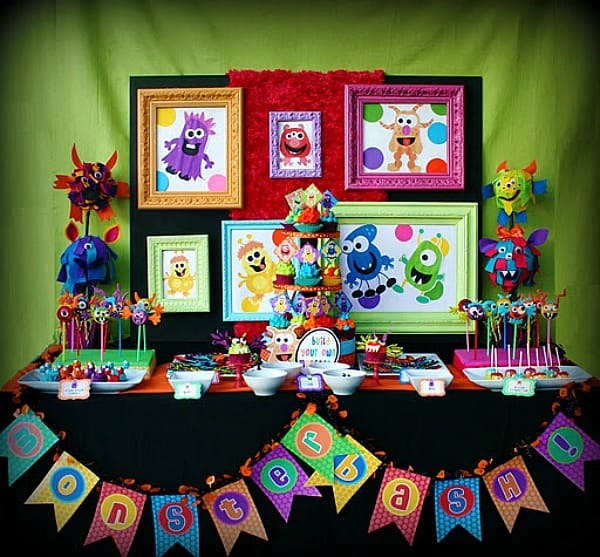 Check out those framed monsters as a backdrop to the dessert table – adorable! Here’s another craft that I think I could tackle for a Monster Party! 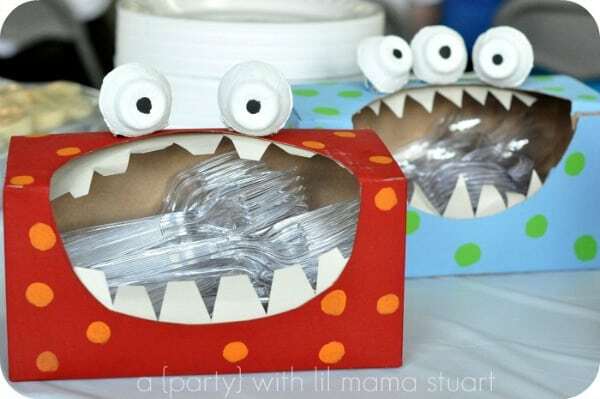 Check out these fun monster utensil holders by A Day With Lil Mama Stuart. I just adore these colorful little critters used over in a Monster Party feature on Bird’s Party. 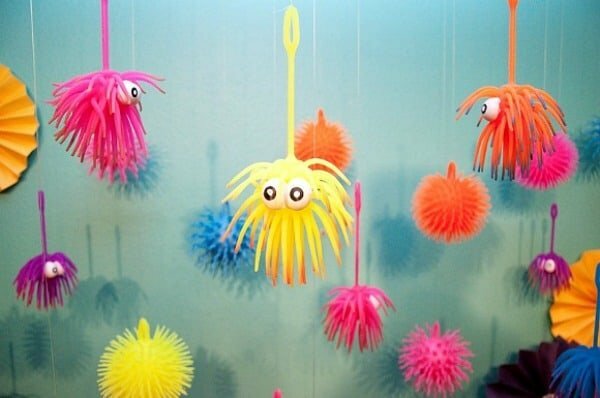 Not only would they be great decor hanging above the food table but the guests could each “adopt” one after the party to take home as part of their favor bag. 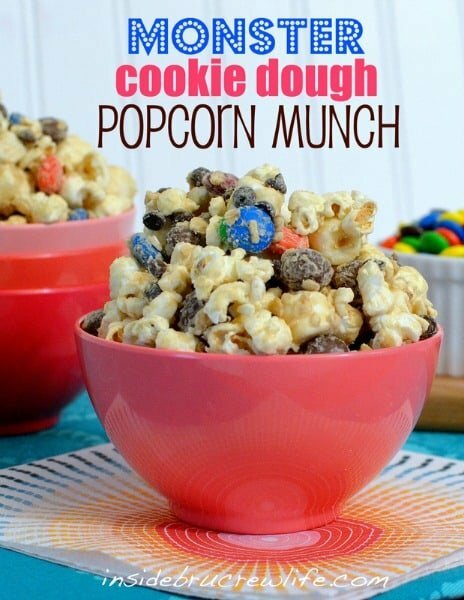 Speaking of favors, I love the idea of this Monster Cookie Dough Popcorn Munch as a favor for the guests to take home. Doesn’t it look delicious?! You can read how to make your own over on Inside BruCrew Life. So there you have it – some of my favorite monster party ideas from talented bloggers and party designers. Which one is your favorite? Let me know in the comments below. 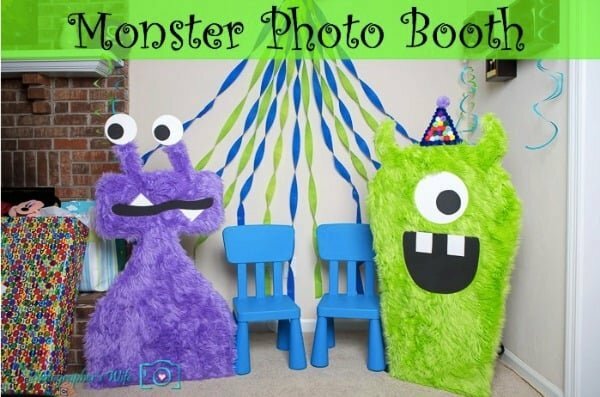 Don’t forget to head over to my post for even more fun Monster Party Ideas. For other fun party themes, ideas and free printable checklists, head over to our Birthday Party page. We’re always adding new ideas so follow along on Facebook, Twitter, Pinterest or our new RSS feed Bloglovin’ so you never miss an update!